Cory Daviau submitted this photo and caption. My name is Cory Daviau. Last summer, there was one shy trumpet player (Victor) that was singled out for having a spectacular high note range, but everyone was too nervous to meet him. I decided I should introduce myself and show Victor the Jersey Surf family. Not long after our first couple rehearsal camps in the horn line together, we had created a hand move and phrase for our interactions …"Shake N' Bake." All summer long "Shake N' Bake" and the Jersey Surf came to the field with the best performance possible. I'll never forget how I made such a great friend by just trying to make a new kid feel comfortable in new surroundings. Although I'm not marching this summer, "Shake N' Bake" still lives with the Jersey Surf and is so far having another spectacular season. 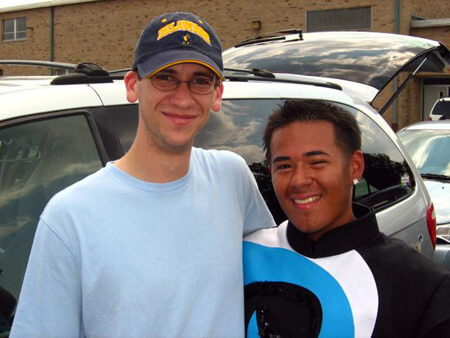 This is Victor and me at the 2008 Surf Alumni show and tell performance.